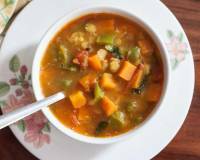 A delicious, healthy and tangy diabetic friendly sambar recipe Kollu Sambar Recipe or Horse Gram Sambar With Vegetables is a must try. Serve Sprouted Kollu Sambar Recipe with Rice With Quinoa, Gawar Phali Methi Ki Sabzi and Carrot Cucumber Tomato Salad for a healthy diabetic friendly meal. 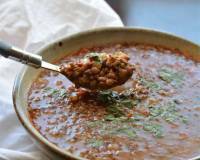 Sprouted Kollu Sambar Recipe is simple and completely satisfying to eat. 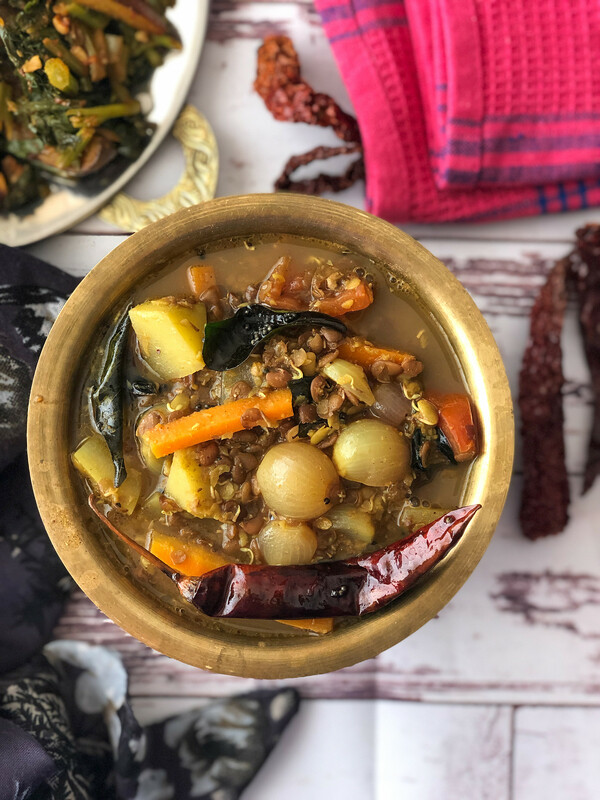 Vegetables like carrots and bottle gourd are cooked with tangy tamarind water and sambar powder and later mixed with cooked Sprouted Kollu or horse gram dal to make this delicious sambar. 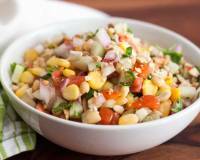 Did you know: Horse gram is rich in dietary iron and calcium and a rich source of protein. Sprouted horse gram increases the availability of iron and calcium increasing its nutritive value. Serve Sprouted Kollu Sambar Recipe with Rice With Quinoa, Gawar Phali Methi Ki Sabzi and Carrot Cucumber Tomato Salad for a healthy diabetic friendly meal. To begin making Sprouted Kollu Sambar Recipe first add the sprouted kollu dal in a pressure cooker with three cups of water and pressure cook for 6 whistles. Turn off the heat. 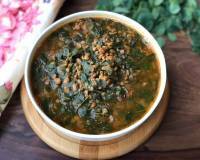 Open the pressure cooker after the pressure has released naturally and mash the horse gram dal a little. 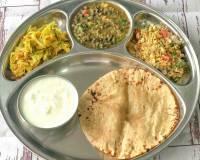 Remove the dal into a bowl and keep aside. In the same pressure cooker add carrots, bottle gourd, tamarind water, sambar powder, sambar onions, turmeric powder, tomato, salt to taste and pressure cook everything for two whistles. Release the pressure immediately. 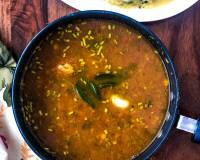 Add the cooked sprouted Kollu dal to the cooked vegetable and tamarind mix and bring the Kollu Sambar to a brisk boil. Check the salt and spices and adjust according to your taste at this stage. Next heat oil in a tempering pan and add mustard seeds, dry red chillies and allow the mustard seeds to crackle. Next add asafoetida and curry leaves and pour it into the Sprouted Kollu Sambar. 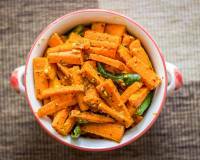 Transfer the Sprouted Kollu Sambar into serving bowl and serve hot.